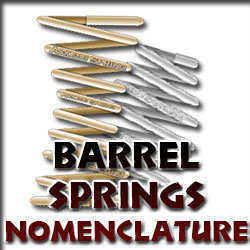 Definition: Barrel springs are compression springs which are helically coiled round wires forming a convex or concave shape. They are used to provide balance and reduce the solid height. The hourglass/barbell shape some barrel springs may have due to the ends having larger diameters than the middle coils. The opposite of a concave barrel spring. Convex barrel springs look like a barrel because the end coil diameters are smaller than the diameter of the middle coils. The thickness of the largest coil in the barrel compression spring’s body. The thickness of the smallest coil in the barrel coil spring’s body. The width of the inside of the smallest coil. Calculate by subtracting two wire diameters from the small outer diameter. The free, unloaded length of a barrel spring. The open/active coils in your barrel spring. You may calculate the active coils by subtracting the closed coils from the total coils. The length/height of your spring when it is fully compressed and all of the coils are touching. Because, there is pitch in between the coils, the wire which the coils are made of rises. This is the measurement of how much the angle of the coil is raised. The proportional ratio between your spring’s wire diameter and mean diameter (measured from both the small and large outer diameters). It specifies the tightness of your barrel compression spring’s coils and the level of manufacturing difficulty. 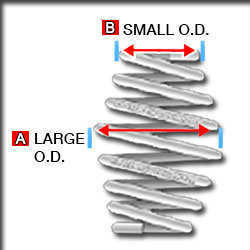 The compressed length/height of your tapered spring when a load has been placed on it. When the barrel spring’s coils perform a telescope effect when being compressed due to the different diameters. The smaller diameter from the top compresses into the next coil’s inner diameter and so on. The motion in which a barrel compression spring is compressed. The distance traveled is the difference between the free length and the loaded height. The maximum travel your barrel spring is able to achieve considering its solid height as to not exceed it. The maximum load your spring can withstand considering its solid height as to not exceed it. Maximum stress at which your barrel spring will perform indefinitely without failure for a given minimum stress limit. The product of exceeding the elastic properties of a barrel spring thus keeping it from returning to its original free length once the load has been released.